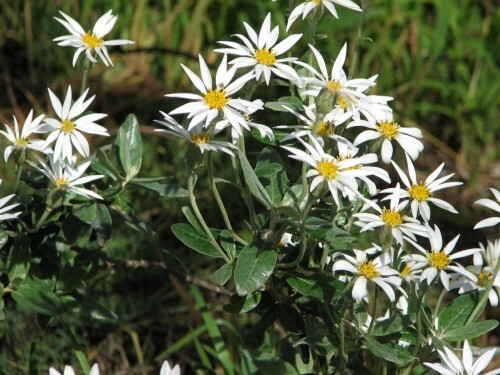 This daisy was the reason I joined the Australian Daisy Study Group. This is one of many study groups set up under the auspices of the Australian Societies for Growing Australian Plants (ASGAP). Most daisies I had seen were relatively insignificant but the large flowers on this plant were stunning. The bush covers itself in 70mm wide white fllowers. I enjoy and appreciate the information that is available through membership of the study group. I noticed that the plants are beginning the spurt of growth that comes just before the flower buds form. It flowers at the end of winter. It is one of those plants that needs to be cut back after flowering. It has the appearance of a shrub but behaves like a perennial plant. New growth appears lower down the stems. I am never sure whether to cut back to the bottom most part of this. Members of the study group have not had a great deal of success when cutting back into older wood on some of these daisies. I have never cut back too severely. This is one that grows quite well in the highly alkaline soil that is in my garden. Not as vigorous as the plants that grow where the rainfall is a little higher and there is not so much limestone.